Discover Rajasthan's rich culture and natural splendours on this walking holiday through its historic cities, remote villages, hills and deserts. Visit majestic forts, opulent palaces and exquisitely carved temples. Immerse yourself in the vibrant street life on carefully planned heritage walks and encounter rural life up close, hiking through tribal heartlands. The trip starts today in the Indian capital Delhi. By way of a leisurely introduction to the city, we head out this afternoon to stretch our legs in the peaceful surroundings of New Delhi's Lodhi Gardens. On our drive there we pass by the iconic India Gate (war memorial designed by Sir Edward Lutyens) and imposing Presidential Palace. One of the city's most beautiful and popular parks, this 90 acre garden contains 15th century tombs, mosques and bridges and a rich variety of trees and birds. Popular with Delhiites as a place to stroll, we plan to join the locals for a cup of chai (strong and sweet milky tea) at a tea shop in the middle of the gardens. By way of complete contrast, we immerse ourselves this morning in the frenetic streets and alleys of Old Delhi on a guided cycle rickshaw tour. The Old City is much closer to the image conjured up by Rudyard Kipling. Weaving our way through the crowds we take in Dariba Kalan (the silver market) and Paranthewali Galli (Lane where Paratha flat breads are made) followed by visit to the Sikh Gurdwara,Sees Ganj Sahib and the Jama Masjid, the largest mosque in India. In the afternoon we depart the capital and drive south to Agra, a journey of around four hours. This morning's early start is rewarded with the spectacular sight of the sun rising over the Taj Mahal during our visit. Over 300 years have elapsed since the construction of what is arguably the world's most perfect and poetic building, yet its beauty and symmetry seem unscarred by age. Created by Shah Jahan as a funerary monument to his favourite wife, Mumtaz, it took 22 years to build. The Great Moghul emperor lies beside his beloved under the white marble dome. We return to our hotel for breakfast before heading out to visit Agra Fort, a magnificent blend of Rajput and Mughal architecture; it contains the beautiful Moti Masjid (Pearl Mosque) with its three domes of white marble. In the afternoon we set out on a guided heritage walk to discover both Agra's past and present. Our route begins at the gigantic Jama Masjid, passing through a maze of crowded lanes before heading to join the throngs at the ever-lively Hindu Mankameshwar Mahadev Temple, dedicated to the God Shiva and famed for its silver lingam (abstract phallic symbol of Shiva's energy). Behind the sanctum sanctorum are several small temples witrhin the main complex. We follow the narrow lanes of the city and head to the spice market of Rawat Para and Namak Ki Mandi, where artisans beat gold and silver foils for use in ayurvedic medicine. Stopping at the 16th century Akbari Mosque, we then follow the stone paved streets to the colourful shops of the Kinari (wedding) Bazaar. Today's four kilometre guided heritage walk is expected to take approximately two-and-a-half hours. Heading west this morning, we soon reach the deserted city of Fatehpur Sikri. Founded in 1569 and abandoned scarcely 16 years later, it is a perfectly intact example of Akbar's imperial court. Among the many noteworthy buildings is the five-storied Panch Mahal, probably a pleasure pavilion for the ladies of the harem. In the centre of the courtyard is the Pachisi Board, where the emperor played a game like chess, with dancing slave girls as pieces. Perhaps the finest structure of all though is the lotus-shaped carved central pillar of the Diwan-i-Khas (Hall of Private Audience). Continuing to Karauli, our drive takes us deep into rural Rajasthan passing through many small villages along the way. Karauli is a holy town which has been strongly fortified by its rulers throughout history and you can still see the remains of its walls in places. Legend has it that the ruling family were descendants of Lord Krishna, one of the most loved gods of Hindu mythology. We stay at the family-run heritage hotel, Bhanwar Vilas Palace. This sprawling Art Deco palace is the property of the Maharajah of Karauli - its antique furnishings and decor create an ambience that feels like we have stepped back in time to the days of the Raj. In the afternoon to walk from our hotel into the centre of Karauli where we visit the City Palace. Also used as a residence by the royal family until 1950, it has now been abandoned. Few travellers make it to Karauli and we're likely to have this beautiful building all to ourselves. There's a great view from the palace roof out over Karauli and the surrounding countryside. Among a number of temples within the palace itself is the important Madan Mohanji Temple, dedicated to the Hindu God Krishna, it is renowned for its ancient idols of Krishna and Radha. In the evening it's worth returning to the palace to watch the Aarti ceremony at the temple - its elaborate rituals are an unforgettable experience. After visiting the palace we head off on a guided walk around the streets and sights of the town. Today's three kilometre town walk is expected to take approximately two hours. Today we enjoy a hike in the countryside outside of Karauli, heading to Mamchari Lake. We'll pass by many red sandstone mines where camel carts are loaded to transport the stone around Rajasthan. Formed by the Mamchari dam and a vital source of water in this arid region, there's a chance to spot crocodiles and various species of bird which live here. We drive back to Karauli from the lake and the rest of the day is free to explore Karauli further or simply relax in the atmospheric surroundings of our heritage hotel. There is also the option to attend a cooking demonstration. Focusing mainly on Rajasthani specialties, there will also be the chance to try some of these delicious (and very spicy!) dishes at the end of the session. Today's 12 kilometre walk is expected to take approximately four hours with a total ascent of around 220 metres and descent of 195 metres. This morning we head for the city of Jaipur. Popularly known as the Pink City, it's the capital of Rajasthan. The city was established in 1727 by Maharajah Sawai Jai Singh II, the then ruler of Amer. Jaipur was the first planned city of its time with imposing forts, dazzling palaces, beautiful gardens, lakes and markets. In the afternoon we'll be introduced to the city on a guided heritage walk. Designed to reveal some of this walled city's hidden architectural gems as well its street life. Our walk begins from the Hanuman Temple in Chandpol market which includes many havelis, old temples and artisans' workshops. Stop and enjoy a cup of the sweet masala tea at one of the many street carts. Today's three kilometre heritage walk is expected to take approximately two-and-a-half hours. Before heading out of Jaipur this morning we'll stop to pay a visit to the unique majesty of the Hawa Mahal which is famously known as the 'Palace of the Winds'. We then head on to the town of Amer, 11 kilometres from Jaipur, it is famous for the massive Amber Fort perched high on a hillside with impressive views back down to the town and surrounding hills. We first pay a guided visit to the fort before setting out on a walk exploring both Amer's rich heritage and the natural beauty of Aravalli mountain range. Along our route we meet the local Meena tribal community who live here and learn about their daily lives. We'll pass a number of ancient temples along our way including the 5,000 year old Ambikeshwar Mahadev Temple dedicated to Shiva. Our walk ends at Sagar Lake where we can see the mysterious 'floating palace' of Jal Mahal in the middle of the lake. Four of the palace's five floors are actually submerged beneath the water. Returning to Jaipur we will visit the most famous sights of the city this afternoon; the splendid City Palace, a dazzling fusion of Mughal and Rajasthani design and the remarkable 18th Century observatory of Jantar Mantar. Today's seven kilometre walk is expected to take approximately three-and-a-half hours with a total ascent and descent of 180 metres. Today we drive to Pushkar, a small town located on the edge of the desert with a tranquil lake, small hills with temples on top and a world famous Brahma Temple which is an important pilgrimage spot for Hindus. In the afternoon there is the option to take a camel cart safari, riding on sandy tracks through some of the small villages near to Pushkar, it's a great opportunity to experience this popular form of local transport and interact with local people. We start our walk this morning with an ascent to the top of Ratnagiri Hill where the Savitri temple, dedicated to Brahma's wife Savitri, is located at 692 metres. We will need to climb a long series of 890 steps to reach the shrine from where there's a fantastic panoramic view of Pushkar with its beautiful lake and surrounding villages. After descending the hill by the same steps we continue our walk through the town and local markets to the lakeside area. Said to have been created by the tears of Shiva after the death of his wife Shakti, the lake is surrounded by ghats (steps) and many pilgrims come here to bathe. Pushkar is also known for its colourful camel and livestock fair which takes place over five days every autumn and its Brahma Temple, one of only a few such temples in India dedicated to the Hindu God Brahma. We walk across the festival grounds on our way back to the hotel with the rest of the day left free to explore Pushkar further and soak up the atmoshere in this religious town. Today's six-and-a-half kilometre walk is expected to take approximately three-and-a-half hours with a total ascent of 280 metres and descent of 250 metres. 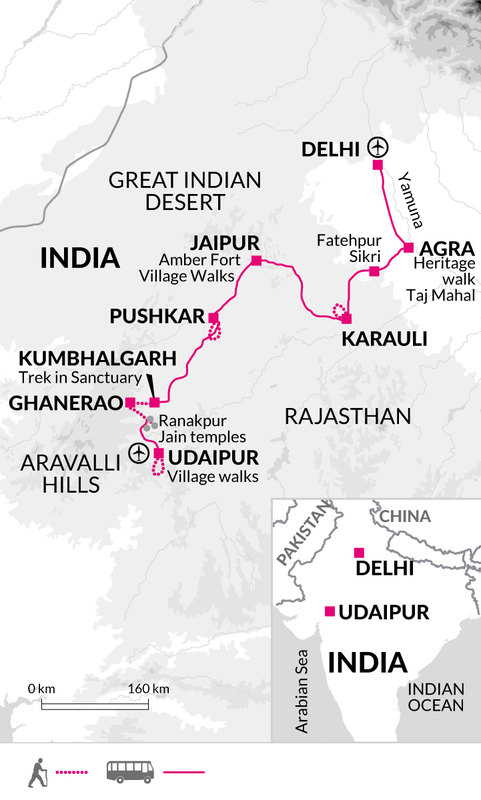 Departing Pushkar today, we head to the village of Kumbhalgarh in the heart of the Aravalli hills, a journey of around five hours. One of the oldest ranges in the world, the Aravallis are the eroded stub of an ancient range running for almost 700 kilometres from near Delhi to Gujurat. The range has a high point of 1,722 metres at the hill station of Mount Abu in the south of Rajasthan. The highest point of our trip is here at Kumbhalgarh, an altitude of some 1,100 metres This afternoon is free to relax and explore and an optional visit to the imposing Kumbhalgarh Fort is highly recommended. One of the finest defensive fortifications anywhere in Rajasthan, the fort was built by in the 15th century and is a UNESCO World Heritage Site. Its massive walls have a total length of 38 kilometres and the view from its ramparts of the surrounding hills and plains below is outstanding. The hills surrounding the fort comprise the 578 square kilometre Kumbhalgarh Wildlife Sanctuary; our trek today descends gradually through the dry deciduous forest of the Sanctuary. Wildlife present in the Sanctuary includes panther, wolf, bear, four horn chinkara, monkeys and wild boar and many species of birds although we are unlikely to see the larger mammals which are incredibly shy. Our route passes through a Bhil tribal village and stops at a small water reservoir called the Crocodile Lake (Thandi Beri) where, as the name suggests, we can try and spot a couple of crocodiles sunbathing on the reservoir wall. We plan to stop here for lunch before continuing through some hamlets populated by another Rajasthani tribe, the Garasiya, to the Muchala Mahavir Jain Temple where the trek ends. It's a short drive from here to the village of Ghanerao where we stay in our second heritage hotel of the trip, the Ghanerao Royal Castle which is still the home of the local royal family. Today's 14 kilometre trek is expected to take approximately five-and-a-half hours with a total ascent of 260 metres and descent of 785 metres. Today we take a drive of about an hour-and-a-half to Phota Deval, from where we start our trek through dense forests of the Kumbhalgargh Sanctuary once again, to a point close to the magnificent white marble Jain temples at Ranakpur. Situated in a wooded valley, the temples date back to the 15th century with the carvings depicting scenes from the lives of the Jain Saints at that time. The Adinath temple contains 1444 exquisitely carved pillars, with no two alike. Later we drive to the beautiful lakeside town of Udaipur. Considered by many to be one of Rajasthan's most elegant and sublime settings, Udaipur is a city of temples, palaces and gardens, encompassing some of the finest examples of Rajput architecture anywhere in India. The focal point of the city is Lake Pichola with its island palace (now a hotel) and Jag Mandir Island. Here the future Shah Jahan sought sanctuary from his father after he had been found guilty of plotting against him. The Lakeside is a beautiful place to watch the sunset, either from the shore or on an optional boat trip. Today's 12 kilometre walk is expected to take approximately four-and-a-half hours with a total ascent of 465 metres and descent of 1065 metres. Our walk today takes us through some of the small villages scattered in the Aravalli Hills close to Udaipur. This area is populated by Bhils (one of India's oldest indigenous tribes) and Rajputs - a caste of warriors, whom are mostly farmers these days. As well as spending time in the villages, observing daily life we can enjoy panoramic views of the countryside. The walk finishes at two temples; one of them is dedicated to Lord Shiva and the other to the mother goddess Shakti. The afternoon is free to explore Udaipur. You may wish to visit to the City Palace, a fascinating collection of buildings built by various Maharana s (Warrior Kings) after Udai Singh and completed in the year 1725. The nearby Jagdish Temple is the largest and the most beautiful temple of Udaipur and also well worth a visit. Udaipur is one of the more relaxing cities in Rajasthan and a there are also plenty of shopping opportunities for anyone after souvenirs. Today's nine kilometre walk is expected to take approximately four hours with a total ascent of 470 metres and descent of 290 metres. The trip ends this morning in Udaipur. Bring a range of comfortable lightweight clothing that can be layered according to the fluctuating temperature. While between November and March daytime temperatures are generally warm and comfortable, evenings and nights can be cold and hotels rarely have heating arrangements comparable with the UK. Although the monsoon rainy season is from June through to early October, it can rain outside of this time so a lightweight rain jacket is recommended. Please bear in mind that shorts and tight revealing clothing worn by women can cause offence and unwelcome interest. One main piece of baggage and a daypack. Bring a 2 litre water bottle, sun cream, sunglasses and head torch. Bring your walking poles if you usually use them. An umbrella is useful for both rain and as a sun shade. Although entirely voluntary, tipping is a recognised part of life in this region of the world. Some local staff will look to members of the group for personal recognition of particular services provided. Accordingly, you should allow £30 for tipping. In order to make things easier for you, the Tour Leader may organise a group tips kitty and if this is the case, they will account for it throughout the tour. 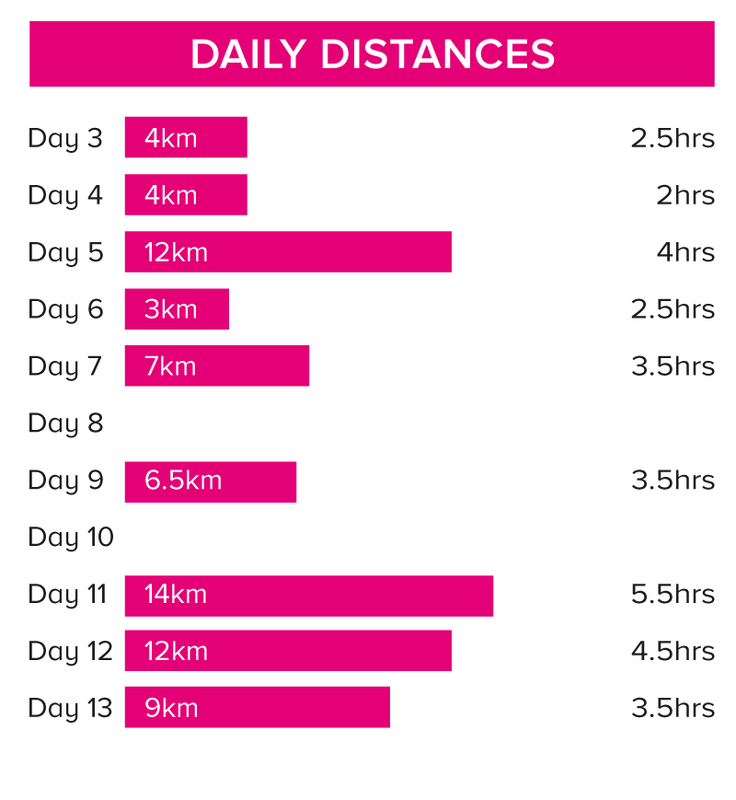 Walks on 9 days for between 2 to 5.5 hours. Terrain includes village footpaths, rocky trails in the Aravalli Hills and through city streets. The heritage walk timings include sightseeing.